This deposition (comprising 2 pages and signed by me) is true and according to my understanding. I am aware that, if proven to the contrary, I will be subject to prosecution if I have voluntarily testified to something with knowledge of it being false or not corresponding to the truth. I am the abovementioned person living in East Goscote, Leicestershire. The full address was previously supplied to police. I live with my husband and our two children of four and two years of age. Recently I was interviewed by police from Leicestershire on certain points concerning the investigation into the disappearance of Madeleine McCann. 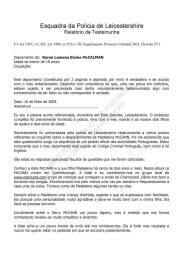 I have been informed that this questionnaire was drawn up following a formal request from the Portuguese authorities. 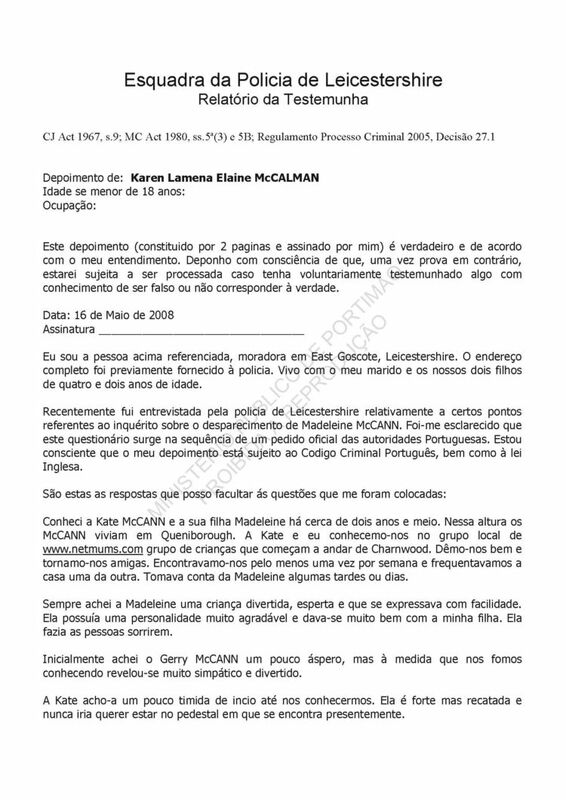 I am aware that my testimony is subject to the Portuguese Criminal Code and English law. I have known Kate McCann and her daughter Madeleine for about two and a half years. At that time the McCANN family lived in Queniborough. Kate and I knew each other from the local group of http://www.netmums.com group of toddlers at Charnwood. We got on well with each other and we became friends. We met at least once a week and we frequented each other's homes. I took care of Madeleine some afternoons or days. I always thought Madeleine was fun [-loving], smart and expressed herself with ease. She had a very pleasant personality and got on very well with my daughter. She made people smile. Initially I thought that Gerry McCann was a bit harsh, but as we got to know each other he revealed himself to be very nice and fun [-loving]. I think Kate was a little shy until we got to know each other. She is strong but modest and would never want to be on the pedestal where she is today. I never saw Madeleine ill and I consider her a healthy child. I never saw changes in her behaviour. Madeleine never made complaints about anybody. She never showed bad behaviour, in fact she was almost the perfect child. We were able to bring her to her senses like she was an adult. She never seemed scared. She was not hyperactive. Regarding the sleep habits of Madeleine, Kate told me that when they lived in Queniborough Madeleine used to wake in the middle of the night and come to bed with the parents for the rest of the night. When they moved to Rothley she began to do this less often and the parents used to give her stickers as a bonus to sleep all night alone. I remember there were many of these stickers in the house, for the nights when she would sleep alone all night. The stickers were glued to the door of the refrigerator. Kate and Gerry never seemed tired and never struggled to take care of the children. I have no knowledge of Madeleine at any time to have been subjected to medication. I only remember her being given paracetamol once when she had a cold. I think the behaviour of Madeleine appropriate for her age. She was very energetic, but a model child. She liked to swim, play tennis and ride a bicycle and attend kindergarten. I think Kate and Gerry were exemplary parents. Kate never raised her voice and always kept herself calm and never seemed tired of her children even on the busiest days. Gerry 'stripped' his professional air such that he came home after work and got involved entirely with the children. I do not remember any more, nor any information or additional explanation that is relevant or which may help in the investigation.